"The best technology-related business book of the year." "A terrific history of blogging and a convincing case for its enduring significance." "Certain to be a classic." Blogs are everywhere. They have exposed truths and spread rumors. Made and lost fortunes. Brought couples together and torn them apart. Toppled cabinet members and sparked grassroots movements. Immediate, intimate, and influential, they have put the power of personal publishing into everyone's hands. Regularly dismissed as trivial and ephemeral, they have proved that they are here to stay. 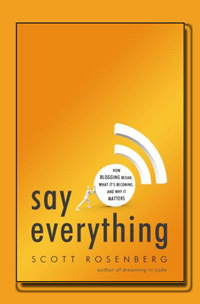 Say Everything chronicles blogging's unplanned rise and improbable triumph, tracing its impact on politics, business, the media, and our personal lives. The book offers closeups of innovators such as Blogger founder Evan Williams, investigative journalist Josh Marshall, exhibitionist diarist Justin Hall, software visionary Dave Winer, "mommyblogger" Heather Armstrong, and many others. Before blogs, it was easy to believe that the Web would grow up to be a clickable TV -- slick, passive, mass-market. Instead, blogging brought the Web's native character into focus -- convivial, expressive, democratic. Far from being pajama-clad loners, bloggers have become the curators of our collective experience, testing out their ideas in front of a crowd and linking people in ways that broadcasts can't match. Blogs have created a new kind of public sphere -- one in which we can think out loud together. And now that we have begun, it is impossible to imagine us stopping. Thanks for visiting this book's website. A good first stop is the book's table of contents and introduction (and, if you like that, the first chapter, too). You can read a little more about me here, or read my brief answers to some frequent questions about SAY EVERYTHING (like, why didn't I just blog the whole thing?). I'll be updating the reviews page as they come in, and listing new events as they get planned. Do email me directly if you want to get in touch. And if you like what you see here, go ahead and order the book!